The Grand Valance, or just “Valance”, is the curtain that masks the top of the Grand Drape. It also sets the viewable height of the proscenium. 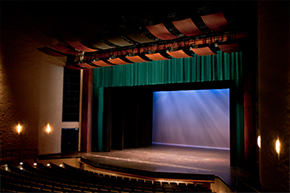 It is a short curtain that is the full width of the proscenium arch. Grand Valances are typically stationary but in theatres with fly systems they will sometimes be placed on a moveable batten so they can be trimmed in or out. The height of the Grand Valance may be adjusted for many reasons. A ballet or a big musical production may want the look of the stage to be big and open, while a dark drama may want it trimmed low to give the audience a feeling that the actors are in a small oppressive space. If the Grand Valance is to be trimmed, the extra height necessary for a low trim must be considered when measuring the curtain. As with many terms in the theatre, correct usage is often venue specific. The terms Valance and Border are in many places used interchangeably.